This vegetarian (and vegan!) 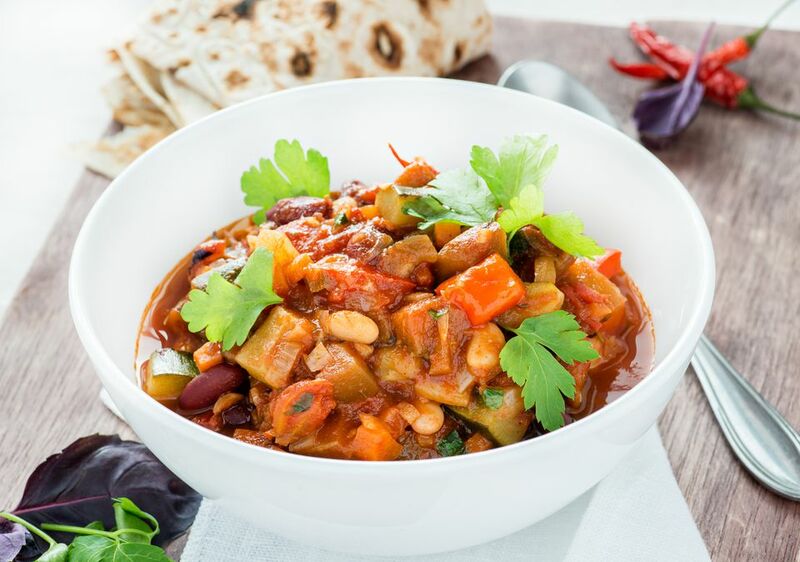 chili recipe packs twice the protein punch with both beans and tofu as well as plenty of flavor from chili powder, bell peppers, mushrooms and a touch of sugar to give it that little extra bit of something. We also like to add a touch of paprika into a vegetarian chili if we have some on hand, and we know a few vegetarians who swear by the flavor-enhancing properties of liquid smoke - add a dash or two right in there, if you'd like. Vegetarian chili is always a great idea to bring to a potluck since it's easy to whip up a large batch. Freeze up any leftovers you have in portioned-out containers, to take into the office for a leftover lunch or, check out these ideas for what to do with leftover chili. In a large pot, saute the tofu in the vegetable oil over medium-high heat for about 3 minutes. Add in the onions, green pepper, garlic, mushrooms, chili powder, salt and pepper, cayenne and cumin. Cook until the veggies are just barely tender, about 5 minutes. Next, add in the tomato sauce, the whole or diced tomatoes, the kidney beans and sugar. Bring to a slow simmer. Cover and allow to cook for at least 45 minutes. Enjoy!